"I am proud that my fellow-countryman Boris Miksic, with his courage, perseverance and great diligence, achieved a real and great success in an expert and professional field. Particularly, I am pleased that he always maintained a human and patriotic relation toward..., his homeland Croatia, which he is wholeheartedly helping from its beginning struggle for independence until this day, on a humanitarian, promotional, business and governmental level. 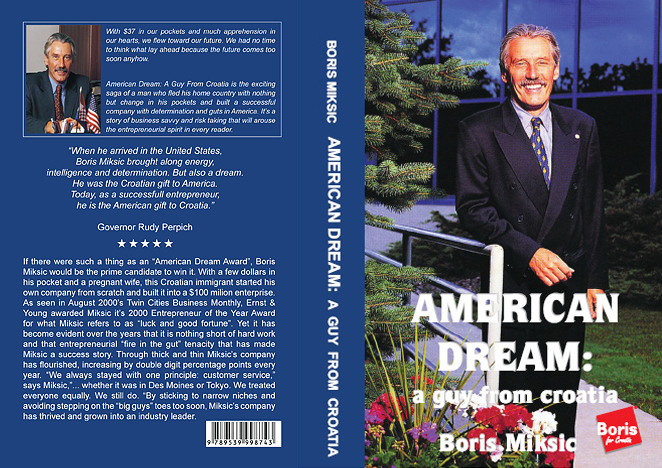 If there were such a thing as an "American Dream Award", Boris Miksic would be the prime candidate to win it. With a few dollars in his pocket and a pregnant wife, this Croatian immigrant started his own company from scratch and built it into a $25 million enterprise. As seen in August 2000's Twin Cities Business Monthly, Ernst & Young awarded Miksic it's 2000 Entrepreneur of the Year Award for what Miksic refers to as "luck and good fortune". Yet it has become evident over the years that it is nothing short of hard work and that entrepre­neurial "fire in the gut" tenacity that has made Miksic a success story. Through thick and thin Miksic's company has flourished, increasing by double digit percentage points every year. "We always stayed with one principle: customer service," says Miksic, "... whether it was in Des Moines or Tokyo. We treated everyone equally. We still do." By sticking to narrow niches and avoiding stepping on the "big guys'" toes too soon, Miksic's company has thrived and grown into an industry leader. "A chance encounter with a couple in a red Ferrari later leads to a way to the West for Boris Miksic. Arriving with no money, less English and a wife, his benefactor sets him up with a job in St Paul. His first assignment: research for the next six months in the James J. Hill Library, named for the great railroad tycoon. When he returns to the office, he finds something amiss; most of the company is more hype than real. Meanwhile, he buys a home, then decides, what if he started a company that made real products to fight corrosion? Rust, after all, never rests. Capitalism is rotting and Miksic will save it. He borrows against his home, prints some brochures and gets a request from a Japanese company for more information. This is where it gets interesting. What does he do? He has just enough money to fly to Japan and gets the Japanese company to agree to provide lodging. He insists on staying until the purchase order is in hand and they agree to hand it over - perhaps to just get rid of him. In any case, he's in business and begins his chemical company in his sink with a coffee grinder to mix his product. His first sale whets his appetite for more and the race is on. Miksic achieves scale but a later economic business cycle puts the future of the business in jeopardy. His company gets rescued but now he is an employee in his own company. Soon he is on the street himself and without its human sales dynamo the company goes into decline. Could he take it back? Perhaps he would. Of course he does. Later he finds all the company's leads for product were tossed in a shoe box by one of the Wall St hires. Brilliant! Miksic hints at the coming great corrosion tsunami now hitting the US because of Ultra-Low Sulfur diesel and E85. New fuels are corrosive and can get real nasty. Miksic achieved his success by doing the work that he believes many companies today skip; simply going to the prospect and asking for an order. Be it the Larkin Soap company in the 19th Century or Amway in the 20th century, this is a tried and tested methodology sometimes overlooked because of its simplicity. "You're not in business just to supply the product; your goal is to have the customer feel cared for, to make him feel you are doing part of his job for him." says Miksic. Help the customer to know what he is getting and he will pay extra. 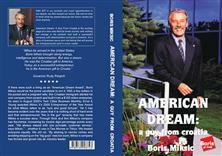 The end of the book brings us up to date in his political campaign in Croatia. If you are interested in a rags-to-riches-to-rages-and-back-again-to-riches story, then you may find this story as enjoyable as I did. This book should be required reading by every teacher in the US. Why? Because the American Dream is alive and well and only needs dreamers - even from Croatia carrying dreams of red Ferraris. He has one of those too."